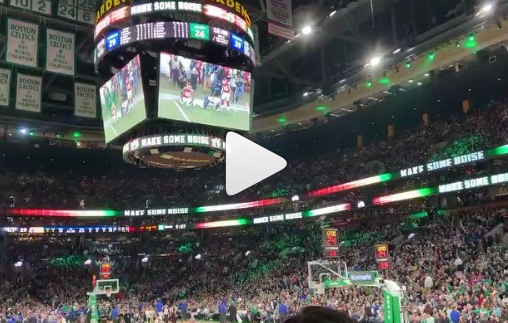 Robert Kraft, Sony Michel, James White, Stephon Gilmore, the McCourty twins along with several other New England Patriots players were on hand for the Celtics and Warriors tonight at the Garden. At the end of the first quarter the Celtics fired up the crowd with a video of notorious Patriots haters Rob Parker and Shannon Sharpe claiming they would lose last weeks matchup versus the Kansas City Chiefs. The video included many clips of the Patriots upset win that sent the crowd into a frenzy. The Patriots will be headed to Atlanta tomorrow for Superbowl LIII following a send off rally. I absolutely love how these Boston sports teams stick together.